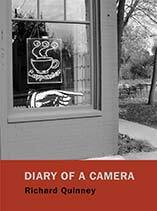 Diary of a Camera is Richard Quinney’s meditation on the art and history of photography. Printed in the tradition of fine art photography, the book features 173 black and white photographs by Quinney, each accompanied by a narrative vignette that provides a perspective on the history of photography and the changing technology of making visual images. I have been waiting a long time to tell you this: I am a camera. For the greater part of my life, I have been silent, except for the sound of the shutter. And that has been fine with me; there is certain awareness and concentration in silence. But recently with verbal ability was granted to me, I am able to tell you what I am seeing, and how and why I am seeing, in the course of making photographs. What follows is the year’s diary—visual and verbal—of my life as a camera. These images and these words I give in gratitude for this life. Come, let us go, for we have miles to travel, things to see, and thoughts to share in this magical and wondrous year.